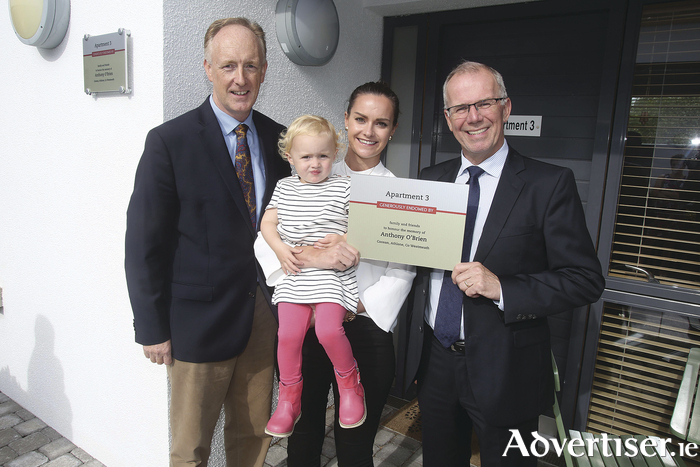 Pictured at the naming of a patient support apartment at the Croi Heart and Stroke Centre were (left to right) Neil Johnson, Croi with Deirdre and Ellie O’Brien and Kevin O’Reilly, chairman, Croi. A patient support apartment at the Croi Heart and Stroke Centre in the city has been named after a young man who died from a heart attack. The facility in Moyola Lane, Newcastle was called after Anthony O’Brien who was the manager of the Corrib Oil service station and store in Ballinasloe. Less than a year after his sudden death, his wife, parents, friends and neighbours came together to organise a memorial charity cycle in aid of Croi. The event, which took place in May, attracted more than 200 cyclists who cycled from Athlone to Galway and raised the phenomenal sum of €95,000. Such was the popularity of this young man and his family that support for the event was received from far and wide throughout County Galway and Westmeath. Anthony lived in Athlone with his wife Deirdre and their young daughter Ellie. However, his father Kevin O’Brien is originally from Killimor and his wife Deirdre is a palliative care nurse who trained at University Hospital Galway. In recognition of very significant donation to the fight against heart disease and stroke, Croi hosted a reception at its centre recently and dedicated one of its patient support apartments to Anthony’s memory. The naming ceremony was attended by both the O’Brien and Mannion families and members of the memorial cycle organising committee. Speaking at the naming ceremony Croi chairman Kevin O’ Reilly paid tribute to all those who organised, participated and supported the Anthony O Brien Memorial Cycle. Page generated in 0.1877 seconds.